My hopeful intention for the Visual Arts Daily is to offer each day a small taste of the beauty found in paintings, photography, architecture, magnificent gardens, or wherever else it’s found. Please visit often. I will, of course, continue the Public Reader until age perhaps catches up with me; hopefully that's a long way down the road. From Henry V. A favorite of mine. Have you not heard it said full oft, a woman’s nay doth stand for naught? Ibid xiv. So What's Wrong with Norman Rockwell? I have never understood why the art community looked down their respective noses at illustrators. 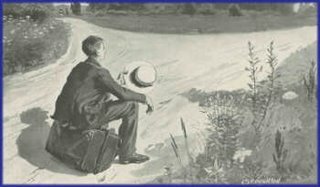 Just a few that I recall quickly are Norman Rockwell, N.C. Wyeth, J. Leyendecker and the son of N.C. Wyeth, Andrew Wyeth. I suspect illustrators, the really good ones, take home some handy amount of change if they are still in the work-a-day work routine. But I suspect that it was and maybe still is a class thing. I ran across this in an Art for Dummies book recently, and a person of no less qualifications than Thomas Hoving, an elite art historian wrote what follows. In addition to an acceptance of all styles and modes of expression today there's a refreshing gradual disappearance of art critism based purely on ideology. Critics and historians are beginning to recognize that styles are simply languages with one no inherently better than another. There are fewer and fewer art critic fights and tantrums defending one style against another. There's also a forgiving, permissive mood currently gaining ground in the art world. 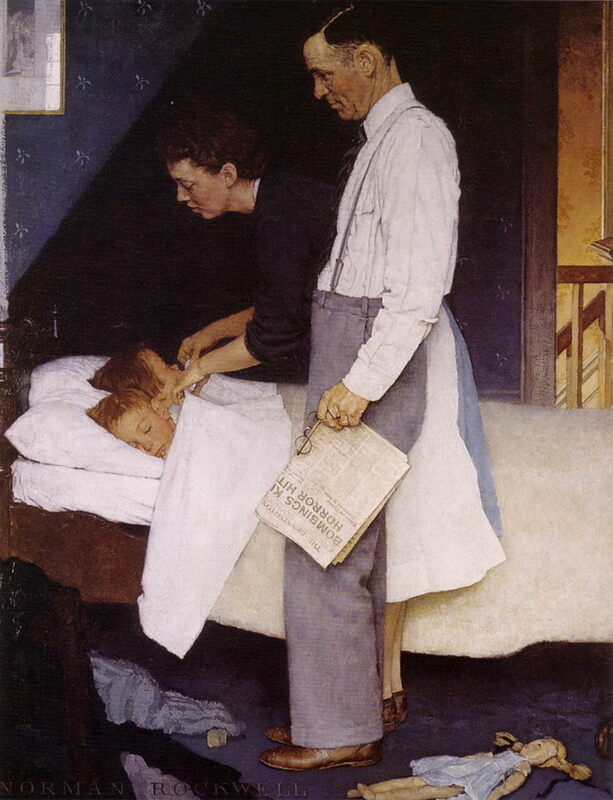 Norman Rockwell (1894-1978), who only a decade ago was considered by most art critics to be a hopelessly mawkish illustrator of little talent and no energy, has recently been touted, even by the curator of 20th century art at New York's Guggenheim Museum (which has the subtitle of The Museum For Non-Objective Art hardly Norman's forte), as a major artistic force and potent communicator in America from the 1930's through the 1960's. I agree. 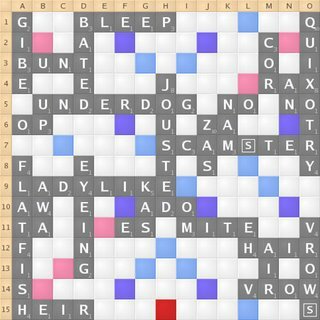 Scrabble has to be one of my favorite board games. I've mentioned before of my liking many of the games offered on the internet, but Scrabble or it's variants, is one of my favorites. I mentioned before also that the site ITSYOURTURN.COM has an offshoot of the game called Jamble that my sister-in-laws husband and I have been playing continuously now for quite a while. So, when I saw this hyperlink in REDDIT, that directed me to this article in SLATE, I had to make the trip. A man, whom the articles states is an ordinary player like most of us, got the unbelievable score of 830 it sent shivers up my spine with the visions of glory that could be within the reach of even us mere mortals. Well not really, but the words he used are not the fancy schmanzie ones, but words like FLATFISH. I could have thought of a word like that. Read the article and dream on. THIS IS THE FINAL BOARD. 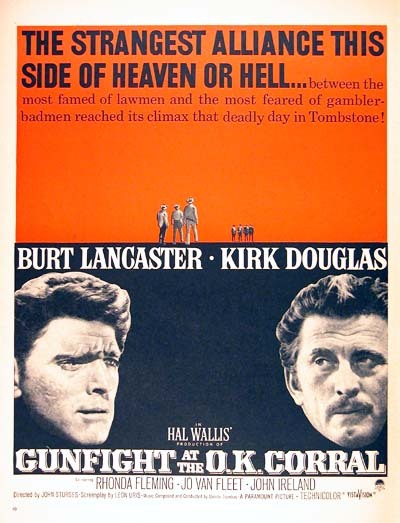 Today in 1881 the gunfight at the OK Corral took place in Tombstone, Ariz., as Wyatt Earp, his two brothers, and ''Doc'' Holliday confronted Ike Clanton's gang. Three members of Clanton's gang were killed; Earp's brothers were wounded. Originally uploaded by Daníel Starrason. Another great flick from flickr. The locale of the shot is Iceland. This is one very good video. Music by two great musicians. A mood setter and nostalgic. I have also included the very somber piece, The Theme from Schindler's List, written by John Williams and played by the greatest fiddle player of our time Itzhak Perlman. It is sad and evocative of unbelievable cruelty, but the music and musicianship is superb. Take a few minutes and enjoy. Bob Kane, the cartoonist who developed Batman, was born this day in 1915. Born in New York City, Mr. Kane attended Cooper Union and the Art Students League. His first comic strips, ''Peter Pupp'' and ''Hiram Hick,'' were published in 1936. He lived in the Batcave, drove the Batmobile, which had a crime lab and a closed-circuit television in the back, and owned a Batplane. He also kept a lot of tools in his utility belt, including knockout gas, a smoke screen and a radio. The above is a portion of Mr. Kane's obit from the New York Times. I grew up in the forties, and early fifties so I remember listening to a lot of programming on a big Philco radio. After school serials were favorites. The following little story was a little fantasy trip back to those days. “Boy oh boy, what a really rotten day”, Pete was thinking, as he opened the side door, really glad to be home. After days like this I can’t get home soon enough, he thought. The day started out bad when my mom, who was heading off to work in the defense plant, called me to get up as usually does. “Yeah mom, I’m awake”, I said. Not true. A half hour later the eyes pop open and I know something is not right. It’s too quiet. Mom has gone to work, I know it, and I’m going to be late. I leapt out of bed and sure enough she’s gone. It’s going to be a bad day. There were no surprises. I had to go to the principal’s office and explain why I was late. In my rush I forgot my homework and my teachers were not pleased with me. At lunch the cafeteria served Spanish rice, not my favorite. And if the day wasn’t going badly enough, at recess it was decided by Clench, the school bully, that I would be his target for the day. But one good thing happened, evidently Clench was off his game today and only pushed me down on the ground three or four times. That seemed to satisfy him and my life was saved. And then finally, at three thirty, the dismissal bell rang and my terrible day was over. When I arrived home to a little peace and quiet, I threw my books down, poured a glass of cold milk and globbed some peanut butter on a couple of fold-overs. I sat myself down in front of our big Philco floor model radio and turned the on switch, and finally I was able to take a long breath, and get ready to enter the world of Jack Savage. The big radios dial lit up, and I started twirling the dial. The radio was supposed to be a transatlantic model, able to pull in far away stations. But I wasn’t really interested in what was going on in Borneo, so I spun the smoothly spinning gold dial to Jack Savage’s station. What the heck is wrong now, I thought, as the dial seemed to hit an obstruction and stopped well before Jacks station. I thought, well the dial spins both ways so I spun it in the opposite direction. Whatever it takes, I thought. Clunk. It stopped again at the same place as before. As I sat there pondering my dilemma, something strange started happening. I seemed to have fallen into a daze. What the heck is happening to me I wondered, as the room seemed to be spinning and I seemed to be spinning too. Am I getting the flu? Holy Mackerel, I yelled, I was spinning faster and faster until all of the sudden the spinning stopped and I found myself deposited in a land of people wearing colorful sheets. Holy cow I thought as I finally recognized them as kimonos. I was standing near an empty aircraft hangar, when all of a sudden I heard a voice call to me as quietly as he could. “Pete, over here. Come quick”. It was Jack Savage and he was beckoning me to hurry. “I’m glad to see ya pal”, he said. I looked at him questioningly. “Jerry, my sidekick, got sick halfway through the show and I need someone to help me complete the mission”. I don’t have a clue what he’s talking about, but he’s not smiling and seems quite serious, so I’d better get serious too. Night fell and we were busy completing our mission when we were sighted by the notorious super villain Dr. Ito just as we were finishing sabotaging the last airplane. Jack yelled for me to run for my life, and the two of us dashed for the exit. The hangar was huge and we were running as fast as we could, but Dr. Ito’s band of bad boys were hot on our heels. I was running out of breath and was afraid it was lights out for me and Jack, when my vision started to blur as before and I seemed to fall and started to spin round and round before I blacked out. I awoke at home in front of the Philco just as Jack Savage was giving his normal signoff; he was thanking all for listening and was giving a special thank you to Pete Johnson for filling in and doing a great job. I shook my head and smiled as I thought, what a dream that was. I was still smiling when I looked down and saw my oily hands and soiled clothes. Holy cow I thought. Today, October 21, 1858 the Can-Can was performed for the first time in Paris, France. Along with your one a day everyday vitamins, and your slug of orange juice, a great way to start your day is with a dose of good humor. I do believe that in order to get through this life without having a flare up of mental misery, you need to have a sense of humor, and along with that sense of humor an ability to bend when circumstances change, to be able to adjust when things don’t go according to how you think they should. Like the proverbial tree, be able to bend with the circumstances or surely you will break. Being able to laugh at ourselves is an absolute necessity. The moment in our lives when we discover that we are not very important in the grand scheme of things is an epiphany of sorts and a bitter pill to swallow for some. But in a way it sets us free, free from taking ourselves so very seriously. Free from thinking that every word we might speak is going to be taken down and printed in future history books. Sorry to tell you, but it’s not I’m afraid. I believe that our words will blow away with the wind we generated saying them. But that’s o.k. It gives us the freedom to speak our minds or any other sort of gibberish we want and not have to worry about it being quoted. It’s a load off of our intellectual reservoir, which for most of us may not be too deep. So loosen up and read this little joke and enjoy your day. A group of chess players were standing in the lobby discussing their recent tournament victories. After about an hour, the manager came out of the office and asked them to disperse. "But why? ", they asked, as they moved off. "Because," he said, "I can't stand chess nuts boasting in an open foyer." 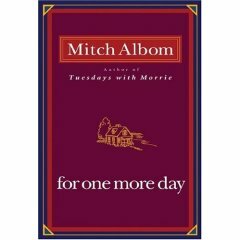 I finished reading Mitch Albom’s current book entitled, FOR ONE MORE DAY. It is a small book in size, about half the size of a standard book and only about 200 plus pages at that, one of those books if it is any good at all that you can finish in a few hours. I finished it in a few hours. I originally wanted to read the book because the title intrigued me and I had enjoyed his first book, TUESDAYS WITH MORRIE. The premise generally asks the question, if you could spend a day with someone who has died, what would you ask him or her, or tell him or her? It is a proposition that anyone who has buried loved ones would jump at, I think. I’ve buried both my parents, as has my wife, and I have many questions about specific issues that will forever remain unresolved. But would I treat my personal ‘one more day’ as a Meet The Press question and answer time, or would I just pick a day to relive one more time? I don’t know. When my mother was dying and she somehow knew she was, she told my wife to tell me if I wanted to know anything about her, now was the time to ask. Out of good manners, or reluctance on my part to possibly cause any more traumas than we were already dealing with, or running into a bad case of becoming tongue-tied, I didn’t ask anything. Yet there are things I would have liked to know. But to sit there in front of her and quiz her like a suspect in a police station, I could not do it. In actuality we probably know the answers to most of our unasked questions, maybe we just want to hear it said, or not said, aloud. Get the book from your library, or if you’re flush with funds, buy it. It will at least give you pause and something to think about. I’m still thinking about it. What do you do when you have run out of places to browse? I’ll tell you where I go; I go to a game. Now I’m not what they call a gamester, one of those really serious, play hours on end, kind of a game player. 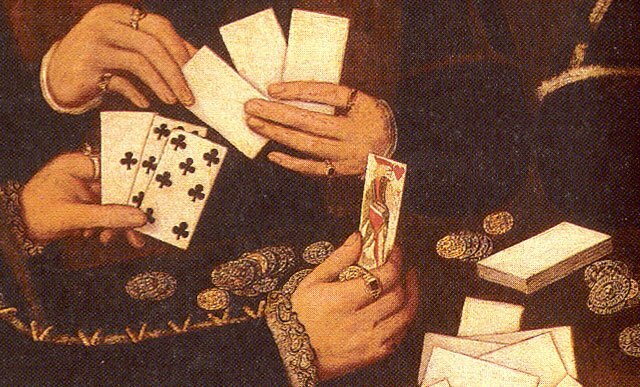 I play what I suppose would have been called in years past as parlor games. Once years ago I was given as a gift from my sister-in-law and her husband two great CD ROM’s marketed under the well-known name of Hoyles card games and Hoyles board games. I have played games off of them for years. My favorites are spades, hearts, and gin rummy, they have many more, but those are the few I can play over and over again. In the board games my favorite is the old game Pachisi. These games are the sort that, at least to me, never gets tiresome. That same husband of my sister-in-law and I have had a running game of chess, along with a game called Halma, a game something like Chinese checkers, and an off-shoot of Scrabble called Jamble on a great game site called ITS YOUR TURN. I make a move and click send, it goes to him, he makes a move and hits send, and that’s how it goes. I admit I am a sap for some games that defy explanation of why do I like doing this. One of the current ones I do that fall into that description is a game called HELICOPTER. All you do is keep a helicopter in the air by missing walls that turn up on your course. It’s very simple and perhaps I am too because I love playing the game. Another game that takes me back to my younger days is PINBALL. It works exactly like, well pinball. Turn the sound on and you’re back in the neighborhood malt shop or gin mill. That's clever, but also insightful. When you reach a certain age in life the thought must occur to almost all of us, did I make the right decisions when I had to? It did to me again recently. In my case fortunately my moments at those crossroads were few. When I rethought what may or may not have gone on at the moment of my personal decision-making I was satisfied that I probably made the right decision for me. I’m glad though that I had put myself into such a position at those times of decision, for if nothing else it signified to me that I had some control over my destiny for good or naught. I believe that when we come to that moment of decision we make the right decision helped by an inner voice that knows us best. A no nonsense voice that knows innately the amount of courage we have, or common sense, or actual ability to carry out what we are proposing. It’s got us down cold. Sometimes we role-play within ourselves, but the inner voice has the ability to cut through the hubris or our self-made hyperbole and cut us short. Some of us will display courage and take the chance and succeed, and those I applaud. The rest of us when we reach that certain age in life and have time to reflect will have made peace with our choices. After all we can’t go back and undo anything, and with most of us, our arthritis or other age related add-ons would make the journey too much for us. I love this film, but it contains one of most sexist lines in all of moviedom. Rick tells Ilsa she won't be able to understand what he's saying , but after thinking of it for a while she probably will. Not a today kind of line, but stangely it was in those times. But as I've read about the movie, it was rewritten almost daily, so maybe not a lot of thought about Ilsa's lack of intelligence was considered. Anyway I loved the film and smile everytime I see this part of it. When I was a youngster I loved to go to the movies each Saturday morning. My favorite funny guy was Lou Costello of Abbott and Costello. He was the one character kids could relate to I suppose. He was always a little slow on understanding what was happening but it always worked out in the end. I read recently that the pair made tons on money during the war years, (WWII) but they both lost it all to the IRS and died pretty much broke. Here is their famous routine, WHO’S ON FIRST. I have seen it so many times, but I laugh each time. What the heck do you do with yourself all day? Sometimes wonder the opposite, what did I do before I retired. Seem to need more time each day to do whatever it is we do. Your heart and mind leads you. What you have read above is exactly the way it should be. You have worked hard and earned your time for relaxation, travel, or whatever you most enjoy. It is not the time to be taken advantage of. If you and/or your spouse have a problem you cannot handle because of your age, contact me, elderly-man and I will set it right and I will enjoy doing it. I can be contacted at the following number. When life no longer seems fair, contact Elderly-Man and he will make the difference. “What the devil are you doing Bruce?” Her brittle voice jolted him back to reality. “I thought I told you to take the garbage out; it’s starting to stink, and when you get done with that I’ve got something else for you to do,” exclaimed Helga, exasperated once again at having Bruce under her feet all day now since he retired and losing patience with his ineptness at almost everything he has tried since then. Well, in real life I’m not exactly your everyday superhero, but in my mind I could live a different life, Bruce thought. For example, just yesterday as I was running an errand to the supermarket, I witnessed a bus driver berating an elderly woman about being too slow to exit his bus. I morphed from Bruce into elderly-man and presented myself at the bus door. As I stood there looking in, the driver in his most bully-loud voice asked if I was sightseeing or was I getting on, I was holding up his schedule. In my greatest duke/clint walk, I entered his bus, and to the drivers great surprise and subsequent fear, lifted him out of his seat by the lapels of his jacket, and proceeded to educate him about the etiquette required from him from this point on to all senior citizens. Further, if I got any report of his belligerent talk, and impolite attitudes, he would be eternally sorry. Of course, he cringed like a beaten dog and acknowledged his wicked ways and promised to correct them. I smiled the smile of righteousness and thought it would be nice and proper if he stood and apologized to all his passengers for his misdeeds, which of course he did. The folks on the bus gave him the look that promised if he did not change they would again contact elderly-man and he would be forever sorry. Then they all stood, smiling and applauded him for his good work. Elderly-man puffed out his chest, smiled the smile of right and good, gave them a wave and off he went, another bad mannered ruffian set right. Oh if she only knew, he thought, and he smiled that elderly-man smile. My daughter and her husband visited yesterday and in the course of conversation we decided to drag out a photo album. It's something we have not done in a long time. While looking at the pictures we came across a few of her great grandparents whom she never had the good fortune of meeting. It brought back many a good thought to me and a few rembrances which I passed along to my daughter. I wrote this little essay years ago, and thought I would post it today as my memories again are renewed of them and, it just occurred to me after all these years, a trait they shared, their complete lack of self. From my perspective they were always giving. It's like I just discovered something I always knew inately, but never until now understood personally what makes some people lovely human beings. I apologize for my babbling. I was blessed with two grandmothers who defined what grandmothers are. One was of ‘English’ heritage and the other German. Two different types you could not invent. 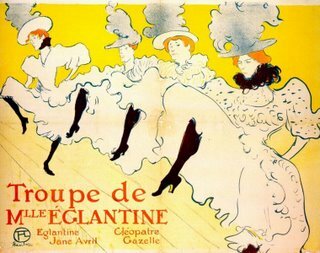 Circumstances had a lot to do with it, my English grandmother whose name was Anna was a tall straight woman who in her entire life never had an excess ounce of weight on her frame. When I saw pictures of the tall spare women who left their homes in Oklahoma during the depression and headed for California, who looked like all hope had gone out of their lives, I was always reminded of my dear sweet Grandma Anna. Her life I fear was not happy. She was involved in a dysfunctional marriage before the term was even invented. Consequently it was only Grandma Anna and no Grandpa. She had very few worldly goods and, of course, nothing to give to a little grandson except her quiet love. She gave that in abundance and I remember her fondly. The complete opposite to my English grandmother was my German grandmother whose name was Barbara, who ran a home filled with people, good food, lots of hugs and a Grandpa who was a typical German immigrant, a big man who sat in his chair and smiled at me but didn’t waste too many words on me. Grandma, a short stout woman who looked strange whenever I would see her without her apron on, cooked, baked, and raised three girls and a boy in a house with two bedrooms and a toilet in the basement and washtubs for baths. It was a home always filled with the good smells of fresh chickens being cooked and strudels, kipfels and other delicacies being baked. She handled a knife with the adroitness of a magician, slicing through dough for homemade noodles and then swinging it around to illustrate a point in a conversation. I loved being around her, and even as a child I knew the significance of her habit of squeezing my face and calling me butchalee. A term with no meaning in the English or German dictionary, but I knew without doubt that it signified love. Now, I am married to a Grandmother. She, like all women, one day without fanfare, or realization of time gone by, find they are suddenly grandmothers. They almost seem to have been implanted with a grandmother-chip, they start doing things that their mothers did when they became grandmothers. Whenever the grandchildren show up at our house, she cannot let them go home without a bag of leftover food, or candy, fruit, or whatever. As the kids are starting to go out the door, she will be flitting here and there depositing things in that bag. It’s a tradition, or maybe just a thing that grandma’s do. A word for all grandmothers or prospective grandmothers, keep up the good work because the little kids will remember forever. Look at me, I’m ancient and I still remember my grandmothers with love, and a smile. I didn’t know it, but my eyes were blinking rapidly as I entered a state of REM, that state of sleep where you dream your dreams. Mine, wouldn’t you know it, mimicked my real life, a life I had screwed up royally time after time. Finally my eyes opened a slit and moved toward the red LED of the bedside clock shining brightly, too brightly. It must still be the middle of the night. Yet when my senses cleared, I was aware it was morning; the unbroken grayness at the window told me it was going to be another crummy day of clouds, and God forbid, more rain. Maybe I’ll just close my eyes for a couple minutes more. Perhaps when I awaken again, it’ll start out better. I’ll feel more rested, the sun will be shining through my window, I’ll be anxious to jump out of bed and prepare myself for another day of commerce in a job that I would enjoy even if they didn’t pay me a cent. I would be working in a career, not a job, a career that I had chosen and trained for through college and postgraduate school. A job I was good at. No, not good at, but excelled at. A job where I was recognized for what I knew and contributed. Oh yeah. Dream on chump. Dive back into those REM’s, because that’s the only place that will ever happen. I dragged myself out of my uncomfortable bed, (purchased used at a second-hand store) glanced at the wrinkled mess and thought for a moment about making it. But then using the uncluttered brain I was given at birth, a brain that has stayed pretty much empty and unencumbered by serious gray matter thus far in my life, rejected the idea as busywork without reason, muttering to myself, “Nobody is going to see it,” the classic answer of the single or divorced man. Yeah, I had botched that also. I once had a wife, a very nice wife as it were, a wife I wore out mentally after what she described as five long years of baby-sitting a grown-up walking migraine. My constant complaining, my constant harping on life’s inequities and my position at the short end of the stick finally drove her muttering, and shaking her head, back to her kith and kin, seeking relief and rehabilitation with ‘normal people’, she yelled as she exited my life. As I sat at my Formica kitchen table set, one of the three pieces of furniture left to me, I poured milk into my cereal bowl. “Is that milk sour?” I muttered to the empty room. A habit I seemed to have developed recently, talking to my surroundings. I didn’t have time anyway to finish eating my corn flakes, the last box of my Post ten selections. I quickly snatched at my bowl, too quickly, and the milk sloshed out baptizing half of my tie collection. “RATS,” I exclaimed saving the bluer language for those jerks on the beltway. After quickly exchanging my foul smelling, sour milk anointed tie for the only tie I had left, a red Christmas novelty tie featuring the Grinch in various Christmassy poses, I headed for the old junker and the beltway. Arriving at work. WORK-that place that occupies most of a persons day, at least eight hours on the job; an hour getting ready to go to and traveling there; another hour going in reverse back to home; and if you are lucky eight hours of sleep. Let’s see, that’s eighteen hours, which leaves six hours to do whatever you really want to do. So it is fairly obvious since we spend so much time working and in work related activities we really should love, or at least, like what we do. Most of us I'm sure do not end up in jobs of choice, but in jobs we fall into by circumstance of good, or bad luck, however it works out. The truly happy worker is the person who knows, has always known, what he/she wanted to do with their lives, and prepares for that profession in college and maybe postgraduate work. Or there is another group who I think enjoys what they do, and that is the entrepreneur, that person whose success is solely a result of his talents and drive. Either group of people is happy in their work because subsequently they are in charge of their own destinies. But now, back to Mr. Schmuck. I no more than got in the door when an office memo was shoved in my face. A sales meeting would be taking place at nine o’clock; your attendance will be required. “Oh my God, not another one of the most boring time-fillers created by the midget brains in the home office”, I exclaimed to anyone within hearing distance. Why those guys in the home office make that big money yet bore us with this stuff is beyond me, I thought. Don’t they have any idea what we need to succeed in the field? Well we’re the backbone of this company and we’ll survive and prosper despite those bozos. Well now that they’ve wasted most of my best selling time with their blabberings, I might as well head for home, I deserve the rest anyway after what they’ve just put me through. Anyway if I get on the beltway now it won’t be quite as busy and I can get home sooner to..do what? I don’t know but I deserve the extra time-off anyway. Thus ends the workday for our common schmuck. “I wonder if I should change my sheets? I think it’s been two weeks since I have, or is it three weeks?” I mutter to myself, and then decide to put it off a little longer, because actually who’s going to see them anyway? will appear from ground to wall. designed to capture creature small. its work bedecks my head. 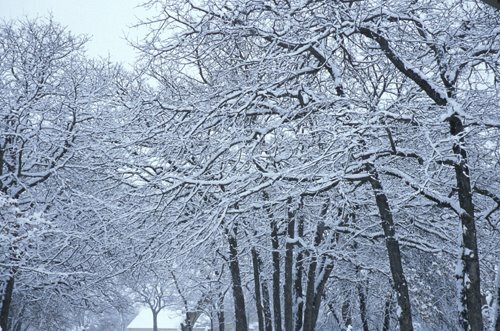 winter, the harshest season of all. a time to foster friendships deep. fall and bring my garage to the ground. I don't know what to think of people who risk their lives for a thrill or notoriety, like Earhart, or the guy who jumped his motorcycle over a canyon, Evel Knevel, and Lindberg. But they make our lives interesting none the less. Here is a chronicle of her last stunt in 1937, written by Keri Rumerman. What turned out to be the final flight of Earhart's career, and, ultimately, her life, began on June 1, 1937. Earhart and Noonan left for their round-the-world flight from Miami, Florida, in her twin-engine, red-winged Electra. From Miami, they flew to San Juan, Puerto Rico. Right before taking off on this leg of the flight, Earhart was quoted as saying, "I have a feeling there is just about one more good flight left in my system and I hope this trip is it. Anyway, when I have finished this job, I mean to give up long-distance 'stunt' flying." As Earhart's journey continued, news of her flight made the front page of newspapers around the world. She sent reports of the land, cultures, and people she encountered. On June 30, 1937, Earhart and Noonan arrived in Lae, New Guinea. They had traveled 22,000 miles (35,406 kilometers) and had 7,000 miles (11,265 kilometers) left to go. Their next destination, and the most dangerous stop of the trip, was Howland Island, a tiny island in the Pacific Ocean, 2,556 miles (4,113 kilometers) away. Before Earhart took off from Lae on July 1, there was confusion about which radio frequencies were to be used, which remained unresolved before she took off. As the scheduled time neared for Earhart to approach the island, several transmissions were received from her, demanding to know the weather. A new weather report describing heavy clouds and rain northwest of Howland had been issued, and Earhart had apparently run into the storm. Earhart transmitted several more times but never reached her destination, disappearing somewhere off the coast of the island. A large search party was quickly organized, but no remains of the crew and the plane were ever found. There are many theories surrounding the controversial disappearance of the plane on July 2, 1937. The most commonly accepted theory is that the fliers got lost, ran out of gas, and went down somewhere in the Pacific Ocean. However, as war between the United States and Japan was imminent, there were rumors that Earhart had been on a spy mission for the United States and was supposed to photograph Japanese military installations. This theory says that she crash-landed and was captured by the Japanese, who imprisoned or executed her. A third theory was that her disappearance was staged to allow the U.S. Navy to conduct a search in the South Pacific. 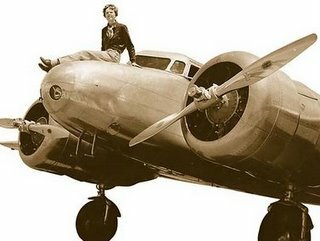 Although only 39 when she disappeared, Earhart accomplished a great deal and is considered a true hero of the 20th century, especially for women. She demonstrated courage, integrity, and an independent spirit. She used her fame to advance the cause of women and showed that a determined woman could achieve anything. 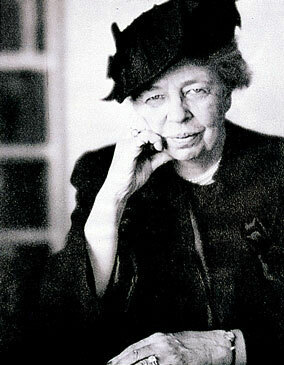 Her efforts led a generation of women to seek new horizons and new roles for themselves.